Rock Springs Ranch, nestled among tall timber and overlooking sprawling pastures, offers exclusive privacy with close access to all the amenities of Central Oregon. Invite your family and friends for a weekend that feels hidden and exclusive in this uniquely beautiful venue with a previous life as a guest ranch. Enjoy the Northwest-style lodge and cabins, the patio overlooking the pond and the ambiance of the outdoor fireplace. Rock Springs Ranch can be transformed to suit many different styles – from rustic and laid back to romantic and chic. With three ceremony sites to choose from, you’re free to create your dream wedding. 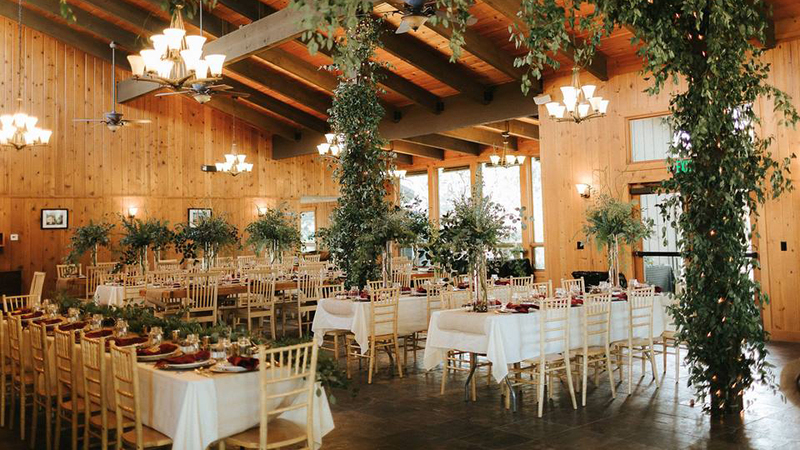 Their rates include all tables, chairs and table linens for up to 200 guests and they offer two packages for their weddings, hosted from mid-May through mid-November. Package One is their main season package and allows access to the facility Friday to Sunday for 200 guests. It costs $5500. Package Two is only available in May and November and includes use Saturday only for 100 guests at a price of $3500.